An FBI agent gathers up crime scene tape while moving the news media further away from a field outside Detroit where agents are searching for the alleged remains of former Teamsters union president Jimmy Hoffa. (CNN) - Just three miles from the house in which I grew up, FBI agents are digging for the body of Jimmy Hoffa. 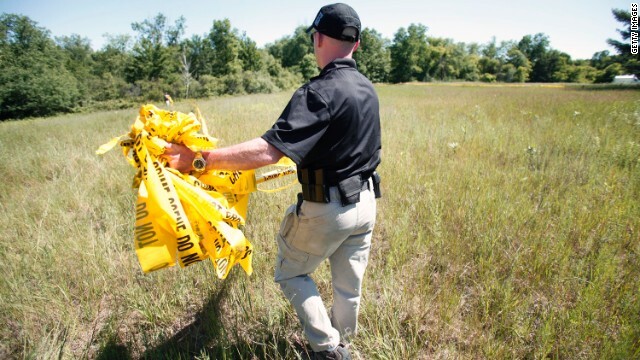 For two days they've been wading through waist-high grass in a field in Oakland Township, Michigan, trying to unearth secrets from one of the most famous cold cases in American history. Hoffa was the leader of the Teamsters, the biggest union in the auto industry, in a time when the Big Three dominated the global car market. But his ties to the mob are believed to be what put him in peril. He was last seen on July 30, 1975 leaving the Machus Red Fox restaurant in suburban Detroit. There have been a slew of tips over the past decade that have led to investigations. Floorboards were torn out of a home in a search for blood, a driveway was drilled for human DNA and most notably in 2006 a horse barn was torn down so FBI agents could dig beneath it. All of these searches turned up nothing. So, why are they digging again? "What I tell people is, if that was your loved one, would you want the FBI and the law enforcement to be doing this? And I think most people would say yes." Andy Arena is a former FBI Special Agent who was in charge of the FBI's Detroit office from 2007-2012. He says the FBI has two messages to send, one to criminals and one to law-abiding citizens: That the FBI never gives up. Investigators tasked with this latest search are carrying binders that read "Big Dig 2" on the cover, a wink to that last hunt now viewed mostly as a punchline. But Arena says this claim carries more weight than any before, because the 85-year-old former mobster who pointed authorities to this latest spot is from La Cosa Nostra in Detroit. Which, unlike the syndicates in other big cities, is made up of only family members, either by blood or by marriage. And who can keep a secret better than family?